Memes like the one above are floating around the Internet since the Pope's back handed comment about Trump. 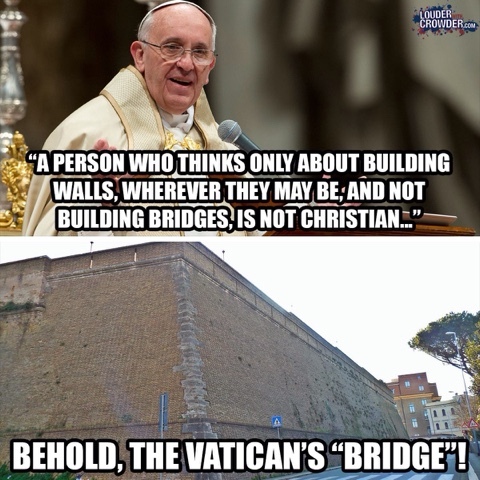 Yes, the Pope did not build the walls around the Vatican and he did not bring in the Swiss Guard to provide him and his city state security. They've been there for centuries. So long the Vatican would seem odd if they were suddenly removed. But the walls are there and the Guard has not been sent back to their home country. It's way to point out what you consider flaws in others, when you're gotten used to and enjoy the benefits the same flaws. The Pope's comments are in tune with Hillary Clinton or Micheal Bloomberg saying law abiding Citizens do not need guns to help them be safe, while being surrounded by armed bodyguards when they speak those very words. Now before I go any farther, let me make it clear I'm not putting forth an effort to defend Trump. I like how he has energized the election race and has forced other candidates to step up their game by dropping the PC crap that's been destroying our country. But Trump would make a lousy President. His out of control ego and how he's so childish when he doesn't get his way is not the characteristics require for a good leader on the world stage. If he refuses to show up to a debate because some cable network news anchor hurt his feelings by asking him a question he didn't like, how is he going to handle foreign dignitaries abroad and other politicians in DC who have different views? Will he boycott and or threaten to sue them as well? But one of the things I do agree with Trump on is we need to secure our boarders to the same level other countries do, like Mexico. Remember our Marine who was locked up in a Mexican prison for months because he took a wrong turn and crossed the boarder? That boarder needs to be as or more secured if one is facing north as it is facing south. Our country needs immigration reform. Major immigration reform. It should not take good people many years and tens of thousands of dollars to come into our country legally. But it needs to be controlled in such a way we make sure the people coming into our country are going to make it better, not worse. The two or three people who follow this blog may have noticed I'm getting into the habit of posting here more often. If you find what I write here interesting, or at least think some of the people you know would enjoy this stuff, please share this with others. Thank you for taking the time to read my rants and ramblings!